Better Than Never: 2012 Plan of Attack! Last year I made a long list of detailed goals for the new year, breaking them down into mini-goals and various steps. It was a good plan and, at the time, suited my life. This year, however, is different. My focus has narrowed, my values have shifted, and I've reached a unique point in my life - a lady's MFA program and her wedding come around but once in a lifetime. Therefore, my goals for the next twelve months are going to be simple and straightforward - write, read, submit, move, and love. I want to think of these five goals less as a list of resolutions and more of a mantra to carry me through what will surely be a crazy, exciting, and memorable year. And just in case those words don't carry the same power for you as they do for me, here's what I'm talking about. 1. Write. Because if I don't write loads of things while I'm in an MFA program, then how do I expect to call myself a writer? No daily goals at this point, because my writing habits shift depending on the project and where I am in the process, but I want to do something for my writing every day (whether it's writing, revising, researching, or just outlining an idea). 2 Read. In past years I've struggled to read 15 books between January and December. Now that part of my job is to read, it's only right I up this number to 25 for 2012. 3. Submit. Send out AT LEAST one story EACH MONTH to a minimum of FIVE JOURNALS. No dicking around. 4. Move. Run my third marathon. Cross my fingers (and train!) for a new PR. Rededicate myself to my yoga practice and complete a month long yoga streak (one hour a day, for at least 30 consecutive days). Continue to be healthy and strong - the older I get, the more it matters. 5. Love. Host a super fun, low stress, and completely memorable wedding (11-10-12!). Be a better friend (call people on the phone, host more parties, show my far-flung friends how often I think of them, instead of just thinking). Volunteer for a charitable organization. I no longer have the money to donate to the issues that matter to me, but that doesn't mean I can't give my time. Write, read, submit, move and love. Oh'twelve, it's on. 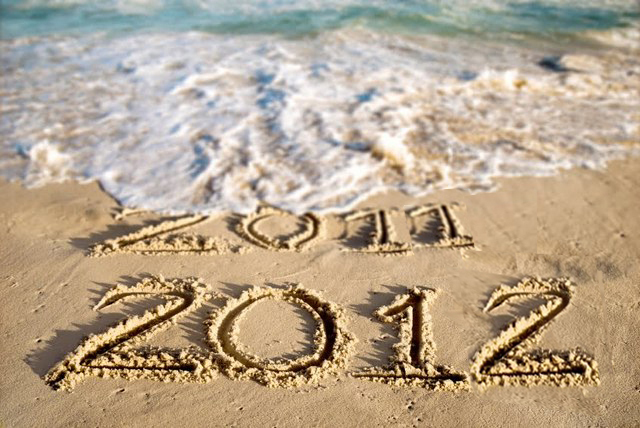 Do you have goals for 2012? If you've blogged them, comment with the link. If you don't have a blog, leave them in the comments. Goals and resolutions are the guiding force of my life and I seriously love to hear other people's Plans of Attack. Happy New Year and here's to an amazing 2012!